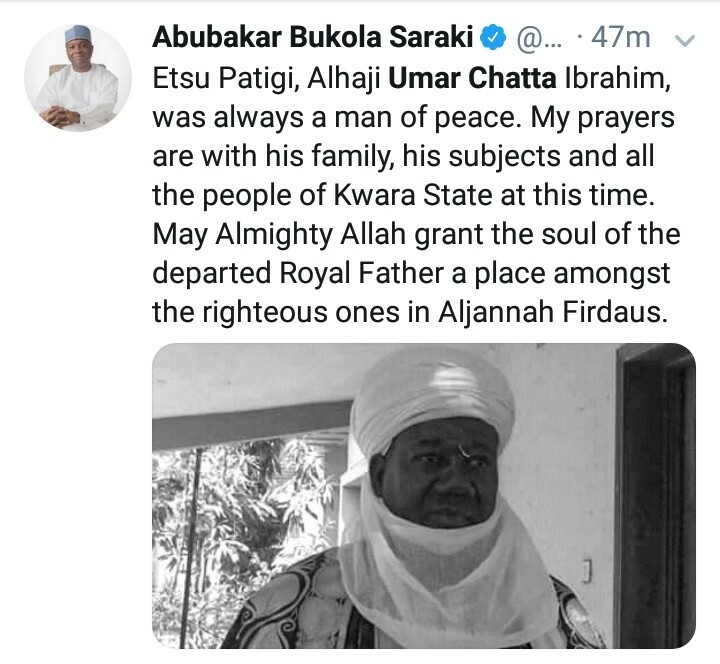 Senate President, Bukola Saraki took to his twitter accounts to react to the death of the foremost traditional ruler in Kwara State, Alhaji Ibrahim Chatta Umar who passed away yesterday night after a brief illness. Etsu Patigi, Alhaji Umar Chatta Ibrahim, was always a man of peace. My prayers are with his family, his subjects and all the people of Kwara State at this time. May Almighty Allah grant the soul of the departed Royal Father a place amongst the righteous ones in Aljannah Firdaus.